In 1517, Mr. Albrecht Durer made a woodcut of a rhinoceros. He had never seen one but worked from sketches and descriptions of travelers to Lisbon where one had been on display. Until that time, the rhinoceros (which hadn’t been seen in Europe since Roman times) was something of a myth. I have done many drawings of mythic birds and beasts; I got started by Mr. Durer’s work (he did a bunny that is a tour-de-force) but also from Mr. Buonarroti’s .drawing of a dragon. Of course, drawings of mythic beasts (including whales, dragons and similar) have a long history going back before medieval times. The particular case in hand owes its existence not only to my ongoing messing about with mythic beasts but also from a show of Keith Haring’s work at the Brooklyn Museum and to the temperature in my studio. It is not air-conditioned, forcing me to work elsewhere without my usual battery of computer, brushes and all that good stuff. I needed simple stuff and there was a Sharpie and an Alvin Penstik at hand. I used them on 18 x 24 inch paper. 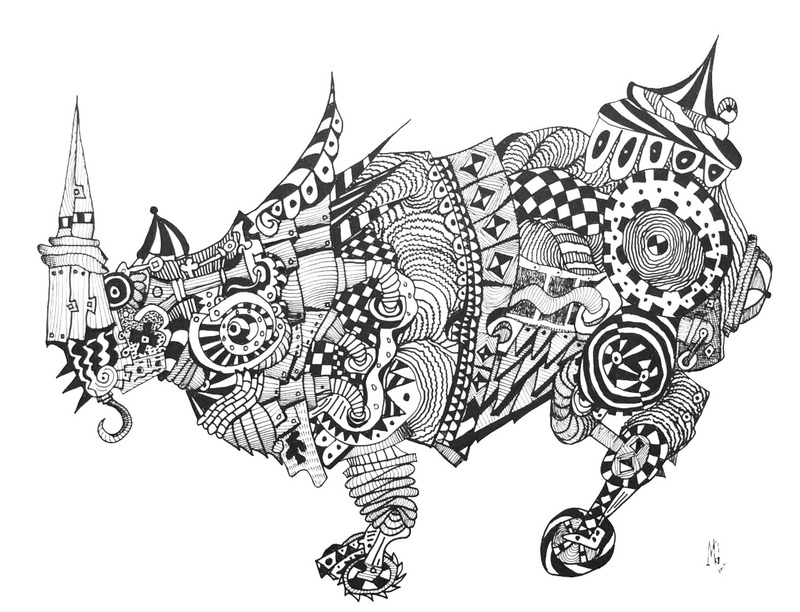 This entry was posted in Uncategorized and tagged beast, Durer, fantasy, horns, illustration, ink, michealangelo, mythic beasts, pen and ink, rhinoceros. Bookmark the permalink. Very nice rhino…may I ask a few questions about your process?